PETER Langdal is finally ready with Moliere's Misanthrope on its own theater with Githa Nørby and Bodil Udsen in the lead roles and SUMMER GUESTS including Sofie Gråbøl , Trine Dyrholm and Nikolai Li Kaas . This winter he in Forum create an amazing musical version of THE ONE AND ONLY and next season waiting for a few splendor - productions in the Royal Theatre's new opera house in Copenhagen . Recipient of the Danish Theatre Journalists price theater Cup (2004) . PETER Langdal has worked on all the major scenes in the Nordic region , has won a host of awards for his work in theater arts and has for the last 12 years along with Henrik Hartmann been an extremely dynamic theater manager in Scandinavia , probably the most trendsetting Theatre : BETTY NANSEN THEATRE , which incidentally has just returned from a unique world tour with Tom Waits and Robert Wilson's illustrious Woyzeck -show. * How do you get as creative leader your employees to perform well ? Hear how to stimulate your employees optimally and create a bright fully working , buzzing engaged gambling with " all contributing" , and how to get the ultimate creative opponent out of the financial constraints ! * How do you create a creative environment ? How stimulates the interaction ? Where does the desire ? How regained self-confidence and faith in everything? How to create excitement and enthusiasm ? * What are the prerequisites for success ? How do you best " off the ground " ? How do you sell your message best ? How do you get the best " your audience " in the speech? 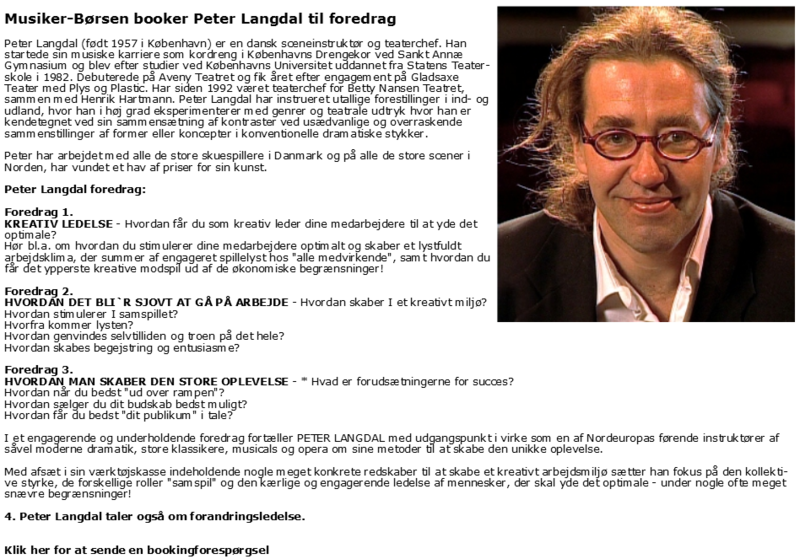 In an engaging and entertaining lectures tells PETER Langdal based on his almost 25 years of work as one of Northern Europe's leading instructors of both modern drama , classics , musicals and opera on its methods to create a unique experience. Based on his toolbox containing some very specific tools to create a creative work he focuses on the collective strength of the different roles of "interaction" and the loving and engaging people management to perform well - in some often very narrow restrictions! director of the Betty Nansen Theatre (sm Henrik Hartmann ) of 1992 and founder of Edison (sm Henrik Hartmann ) .